Pure white lily tulip, very sought-after. Mid season flowering, 40cm. 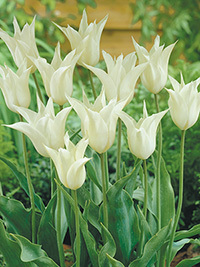 With extremely long and tapering petals, these tulips open like elegantly curved urns. Very graceful and attractive, they have been popular in recent years.